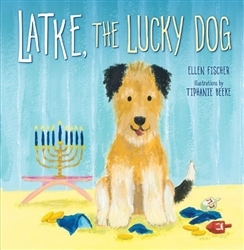 Rescued from an animal shelter on the first night of Hanukkah, fuzzy Latke the puppy joins the family just in time for the celebrations. Although he has trouble learning the house rules and gets into all sorts of hijinks, he is one Lucky Dog! Told from the pup’s point of view, this sweet Hanukkah story for little ones is a great addition to Kar-Ben’s Hanukkah collection.